(born December 5, 1967), is an American country music artist. Signed to Decca Records in 1996, Allan made his debut on the United States country music scene with the release of his single "Her Man", the lead-off to his gold-certified debut album Used Heart for Sale, which was released in 1996 on Decca Records. A second album, It Would Be You, followed in 1998 on Decca. Allan's third album, Smoke Rings in the Dark, was his first album for MCA Nashville, and the first platinum album of his career. Its successors, Alright Guy (2001) and See If I Care (2003), were all certified platinum as well, while 2005's Tough All Over and 2007'sGreatest Hits were both certified gold. His seventh studio album, Living Hard, was released later in 2007. Overall, Allan's seven studio albums and Greatest Hits package have produced twenty-one singles on the Billboard Hot Country Songs charts, including three that ranked number one: "Man to Man" and "Tough Little Boys" in 2003, and "Nothing On but the Radio" in 2004. Seven more of his singles have reached the Top Ten on this chart as well: "Her Man", "It Would Be You", "Right Where I Need to be", "The One", "Best I Ever Had" (a cover of a Vertical Horizon song), "Life Ain't Always Beautiful", and "Watching Airplanes". It’s raw and emotional. It’s freight-train-to-nowhere lonely. 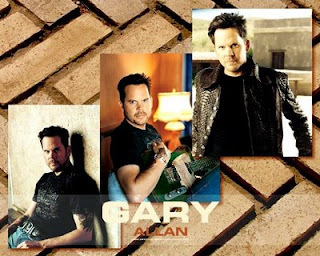 It’s hard-rockin’, no-apologies country music that has traded in its twang for a gravelly growl millions of fans recognize as the voice of Gary Allan. And with Living Hard, his latest release from MCA Nashville, Allan once again proves that, though times may change, the thread of truth at the center of his music remains the same. "I think the fans are gonna feel that this record is different," he says, "but the most important thing is that what I do is authentic. I’ve never pushed for a certain image. I’ve just always done my own thing." This time around, Allan says, that includes letting listeners ride along through his personal landscape over the past year. "The record has taken about a year to make," he says, "and I think the whole thing reflects change. I think every record sort of reflects where I’m at, and I’ve made a ton of changes this year, just mentally and in how I’m approaching everything. Oh," he adds with a grin, "and I think it’s much more rockin’ than anything I’ve done." Allan decided to crank it up musically. "I just felt like I was growing so much and wanted the music the reflect that. I think the result has more of an edge." More edge, from the man who’s already got a reputation as a bit of a Nashville outsider? "Hopefully country music feels like they need somebody like me in the fold just to shake things up," he laughs. Not that this was all his idea – Allan feels some of the changes come from the fans themselves. "It’s not like I was trying for a new direction, it’s almost audience driven, too. l feel like I’ve got this young crowd with me now, I’ve got punk rock kids in my audience. And I grew up with that music, too," says the California-bred singer, "so to me that stuff is right alongside Kris Kristofferson and Waylon Jennings. The people really dictate the music, too. I feed off the audience, whatever they’re really wanting is what they drag out of me. I’ve got the edgy side of the country crowd -- and I want to keep them." No danger of losing them – "Living Hard" is an all-out rocker with a heavy Rolling Stones influence, and in "Like That’s a Bad Thing" he lets it rip with a song that reads like a Gary Allan bad boy manifesto. "That song does sound like me, doesn’t it?" he says. "I think if anything that sort of renegade spirit is even more prevalent on this album. We’ve always danced to our own tune." Checkout his new song…"Livin Hard"
great piece of information and even better piece of art. all the 3 song that you have posted are great. im sure the others are beautiful as well. keep posting good stuff boss.